TripleKnotStudio is relocating! And while this is an exciting time for my family, it is also a very busy (and stressful) time. Therefore, all physical items have been deactivated while we pack up our home, and move. Please keep an eye out in the coming weeks and months as Ready to Ship items get unpacked. Customs and Made to Order items will follow as we get settled. Hello! And welcome to TripleKnotStudio! Thank you for taking the time to look through my selection of crocheted items. I hope you have found what you were looking for. If you didn't, please let me know, I'd love to create a custom item just for you! Check back regularly as new items are constantly in the works. The current turnaround time is listed in the individual listings. I strive to get all orders out as soon as possible, many times ahead of schedule. All items ship through USPS with tracking. If an item is needed sooner, please let me know and I will do my best to accommodate your timeline and ship the item out ASAP. Please note, I use Etsy's calculated shipping algorithm. When purchasing multiple items, this frequently results in shipping overages. Any overages charged will be refunded at the time of shipping. • Average woman - 22"
I can't wait to make this beautiful blanket!! Awesome and super talented seller...highly recommend! The Everly pattern has been added to the shop! You can by a made to order finished hat or the pattern to make one yourself happy hooking! The perfect top for summer! 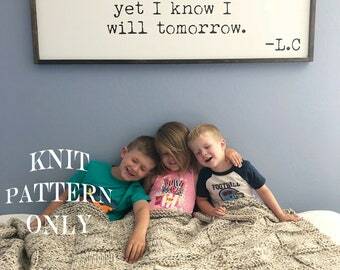 I am a mother to three energetic little ones (my three "knots"). They keep my active and humble, and so very happy. I learned how the basics of crochet in elementary school and from there taught myself how to read patterns and more complex stitches. I love working with my hands and creating special accessories for you and your loved ones. Growing up and living in a desert, there aren't many days in the year where I get to wear my own creations, or put them on my own children; which is why I decided to open up a shop here on Etsy. Living in the desert (and my lack of a green thumb) is also what brought about the beginnings of my crochet garden. I am constantly working to add new plants and flowers to my crochet garden. If you have any special requests please don't hesitate to ask! I LOVE working one on one with clients to create what it is THEY want. So please, if there's something in your head, or something you've seen somewhere, please let me know and I'd love to work with you through convos and emails to create exactly what it is you are looking for! Welcome to Triple Knot Studio! I love creating custom crochet accessories for you and your littles. The listings available here are only the tip of the iceberg, so to speak. So if you have something in mind that isn't currently listed, please message me and I'd be happy to work on something special just for you. Typical turn around is 1-2 weeks (or quicker when possible) the items currently listed. The turn around time would increase for bigger items (such as dresses and blankets) not currently listed. Refunds on made to order items will be handled on a case by case basis. If there was an error on my part, I will remedy the error as quickly as possible. Most items ship via First Class mail with USPS. Larger items such as blankets ship via Priority Mail. If you need an item shipped faster or internationally, please message me for a shipping quote. An email with the confirmation and tracking number will be sent vial email once the label has been created. I do my best to get the boxes in the mail within a day of printing the label. If you are local to the Phoenix area, ask about local pick up.